Here is that website I was telling you about that I used for my shoe lift. A patient with this lesion came in last week. The patient had noticed it for six months. The primary care physician had made three attempts to remove it using N2. This screamed out for a biopsy. The report received back today is positive for malignant melanoma. I'm not really sure why this had not been biopsied before the primary care doctor referred the patient to me for treatment of a resistant verruca. This was from a podiatry online service. When the summer months approaching, do not forget your sunscreen. This middle aged gentleman appeared to my office with big toe joint pain and a large bump at the top of the big toe joint. This bump is called a "dorsal bunion" to distinguish it from the typical bunion on the side of your big toe. 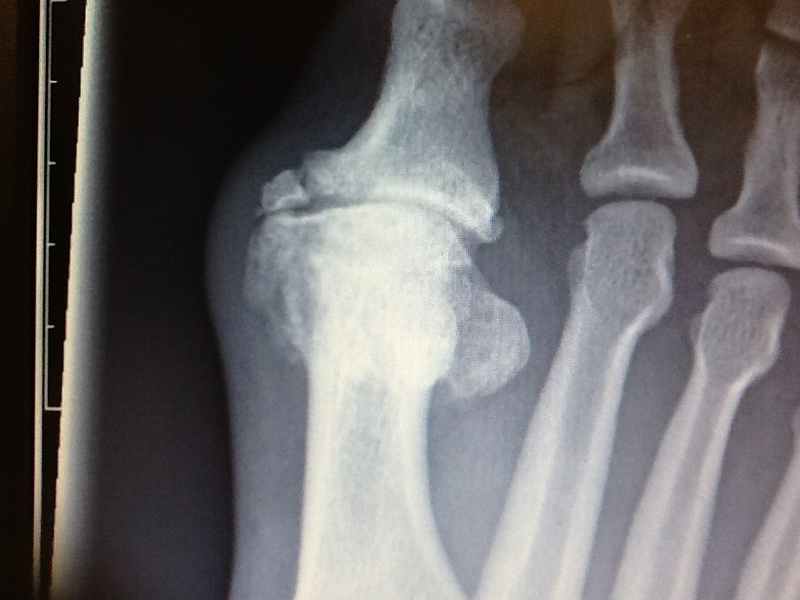 Here is the side view of John's big toe joint with a very large bone spur which will need surgical removal since it is causing him great difficulty fitting shoes. The bigger the spur, normally the bigger the joint breakdown. No surgeon would want to approach this without considering joint fusion. We will be getting an MRI to see if there is any normal joint surface worth trying to save. A total joint implant is probably the second best guess right now. Look at the other view of the joint above. Here the normal appearance of the joint looks distorted normally indicating a severe breakdown of the joint. 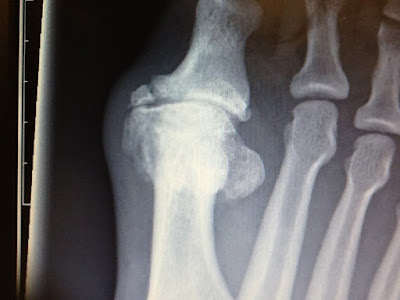 If you look at the bone of the first metatarsal where it hits the toe, it does not look well. As a conservative podiatrist, I will hope that the MRI shows some chance of saving this joint from a fusion, but not a first glance. From Dr Blake: Barefoot or Minimalistic Running Shoes are a hot topic. Please take time to help these 2 great podiatrists do research which may help to prevent many injuries. I would like to request your assistance in a research project on barefoot and minimalist running. The linked document below is the preamble to a survey we have constructed that attempts to ascertain the scope of barefoot and minimalist running both in practice and runners' attitudes. David Cauthon and I wrote one of the most comprehensive reviews of barefoot running to date that was published last year in the Journal of the American Podiatric Medical Association. The survey we created is a follow-up to that publication. We ask your help in distributing our survey link as widely as possible to reach as many runners as we can. The survey population need not be barefoot or minimalist runners as one of the parameters we are investigating is the scope of these practices so ALL runners are encouraged to take the survey. If you work with any running shoe stores, clubs or teams please pass on to them. If your practice has a web site, please post there. Practice newsletters or practice email updates could be other venues. We greatly appreciate your assistance in furthering research that has the ultimate goal of answering so many questions we have about barefoot and minimalist running. Please distribute this link as you see fit and if you have any additional questions, please do not hesitate to contact me at the e-mail below. Thank you in advance for your assistance. David W. Jenkins, D.P.M., F.A.C.F.A.S., F.A.A.P.S.M. 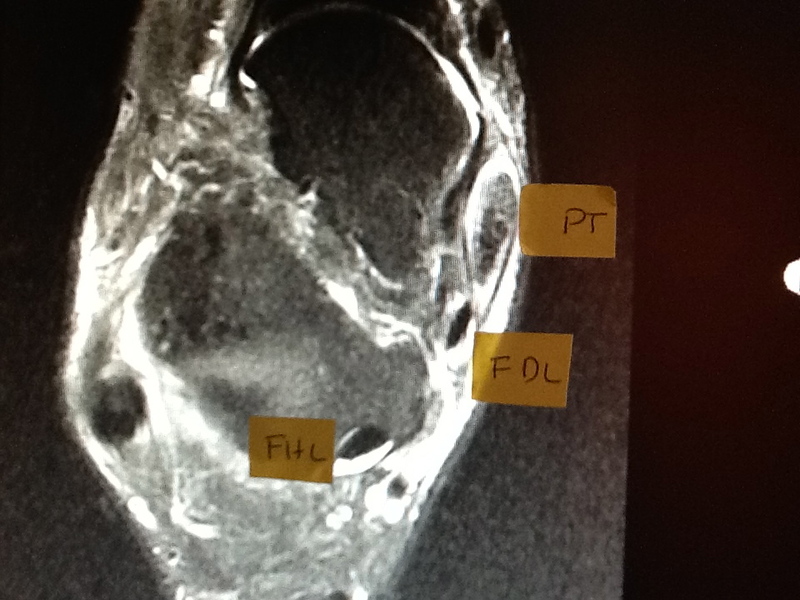 One of my patients recently tore his posterior tibial tendon, the most important ankle tendon for arch support. 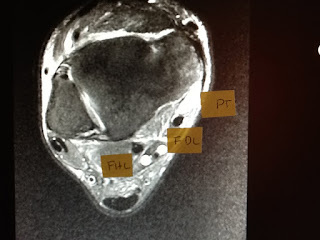 He is being worked up for surgery and I thought his MRI images may be helpful to some of you suffering from Posterior Tibial Tendon problems. The 3 medial ankle tendons that go into the foot are: flexor hallucis longus (FHL), flexor digitorum longus (FDL), and the posterior tibial tendon (PT). See the solid dark circles that make up the FHL and FDL. 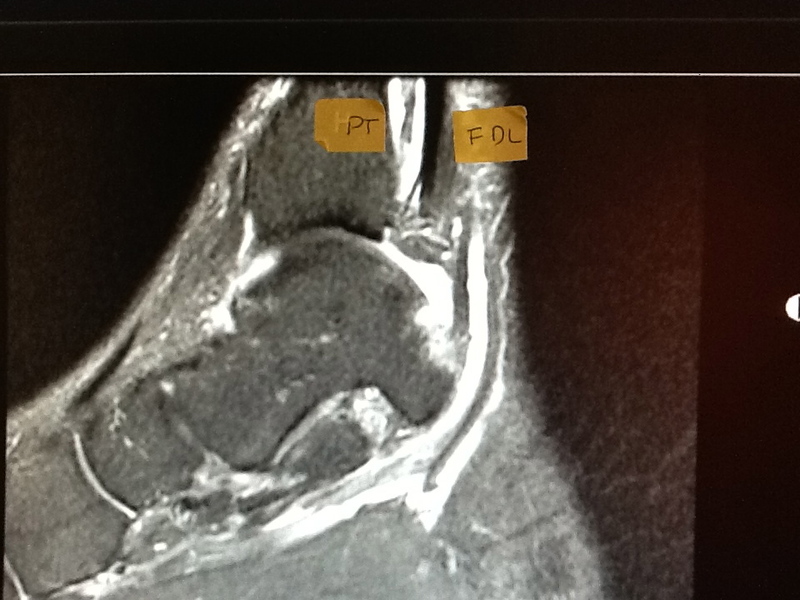 See the white area where the posterior tibial tendon should be. The FHL and FDL are well visualized. 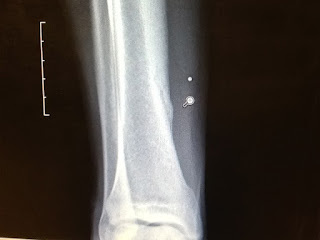 The medial or inside ankle bone shows old bone chips from a fracture 20 years ago by the sensor. As we get further into the foot with our imaging, the area of the posterior tibial tendon is more blown-out than the FHL or FDL. Good, solid, tendons should look dark, condense, and have sharp borders. The PT has none of this. 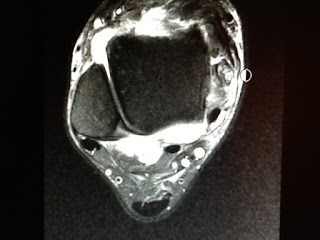 Further imaging into the foot shows the PT tendon non-compact and almost stretched. This side view of the ankle shows a solid FDL tendon as it comes down into the foot, and an almost nonexistent Posterior Tibial Tendon. This is such an important tendon in the body that I am forced to send to the surgeons for repair. Hopefully, once the surgical part is done, I can begin the often 2 years of gradual rehabilitation for full strength. I want to applaud Dr Glass for his outstanding video on ankle and subtalar joint motions. Even though there are a few typos in the text, the great visual is wonderful. Thank you. Plantar fasciitis is an inflammation of the fibrous tissue that connects the heel bone to the metatarsal bones on the bottom of the foot. 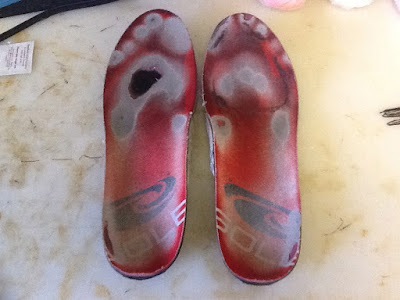 Symptoms can include a burning sensation and aching on the soles, and dull or sharp heel pain. "If, first thing in the morning, your heel is really painful, and then as you walk around it feels better, that is the classic sign," says Sheryl Strich, DPM, president of the American Association for Women Podiatrists. Surprise: "High heels are not the evil-doer," says Dr. Strich. The most likely culprits are pancake-soled shoes with zero arch support, such as flip-flops, ballet flats, and some casual sneakers. And standing for long periods of time in any shoe -- say, if you work on your feet -- can also cause this common injury. Below are several youtube videos on plantar fasciitis stretches and treatments. Recently a long distance runner presented with leg pain of 4-5 months. The pain came on suddenly during a long training run. The patient attempted to run through the pain, because it was not too bad, for 2 months. Then, common sense dictated stopping running for the last 2 months. The pain is not only not better (can I throw a few more nots around) but now hurts walking around which it never did before. He tried changing shoes and icing occasionally. These measures did not help. In a runner with leg pain developed with long distance training, the diagnosis is a stress fracture until proven otherwise. The following 3 X-rays just taken show a healing tibial stress fracture with marked amount of new bone formation. Try to look along the normal border of the bone. As the normal border gets obscure, this is the new bone forming. 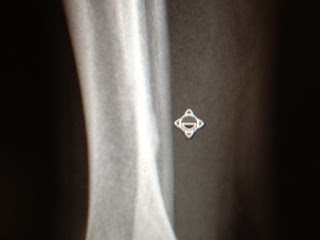 Unlike this X-ray, you normally do not see a fracture line with a stress fracture only the subtle new bone formation. On this oblique view, one can really see the fracture line. Fractures look bad for a long time for 2 reasons. The fracture line looks worse then it really is since there is more water content near the fracture itself in the bone. More water makes the fracture look worse. Fractures heal inside out, so total healing may have occurred internally, but the X-ray still shows signs of the fracture still present. Due to the compression forces and the muscle contractions of the leg muscles, most running stress fractures on the tibia occur on the back surface of the bone. This makes it hard to locate and hard to see any swelling. 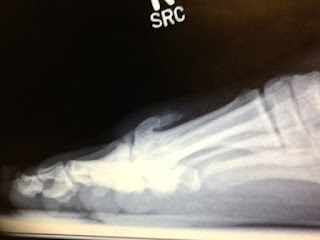 Over the next week, I am going to talk a lot about stress fractures. This is a common one in the lower inside of the shin (tibia) seen in a runner increasing his mileage. 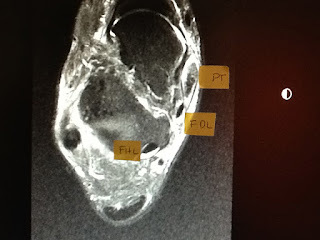 This AP Tib/Fib Xray documented the new bone formation seen next to the marker in a long distance runner. 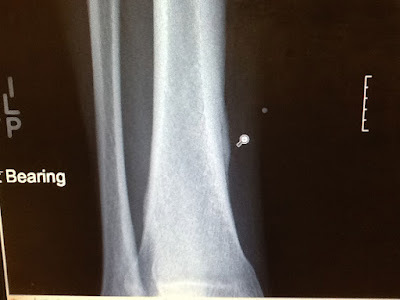 This bone reaction is called periosteal reaction and signifies that the bone is trying to heal. The new bone formation should be the thickest nearest to the fracture. I saw your posting regarding athletes and how if they have a leg length discrepency they should consider a full length foot lift as opposed to a heel lift. I would like to know where I can buy a full length foot lift that is as flexible as the one you show in your pictures. I have recently purchased one of the Clearly Adjustable full length lifts, but find it to be extremely ridgid. I think a more fleixble lift would be more practical for being on my feet a lot. I used to enjoy working several times a week until a recent possible hip injury. I was diagnosed with a leg length difference of at least 6mm and have used a heel lift for several years. I am hoping that trying a full length lift will possibly even out an imbalances in my hips and weight bearing on my feet. Any help from you on sources to purchase these items would be great! Thanks! Dear Jeanne, Thanks for your email and sorry for my delay. The material I use is call grinding rubber and you can purchase several 1/8th inch sheets from www.jmsplastics.com. The trickiest part is to skive the leading edge, but try angling the scissors. 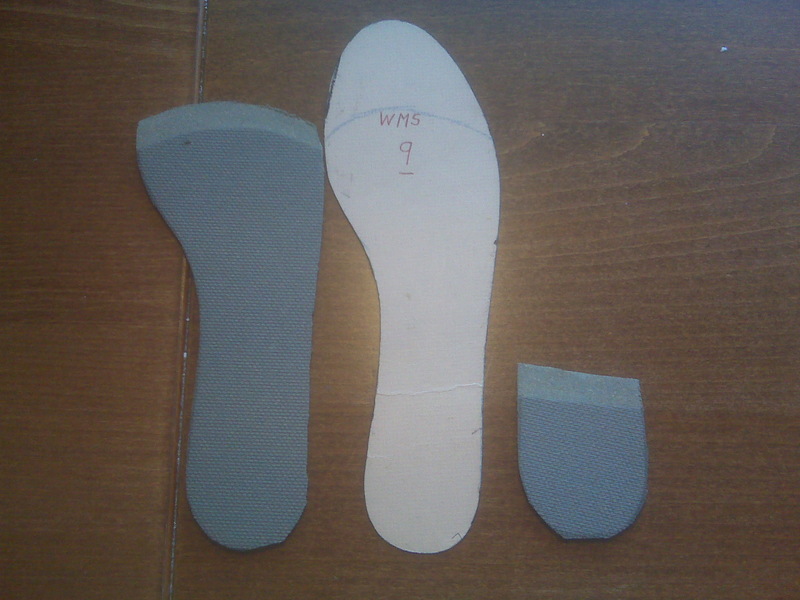 You can also use 1/8th inch spenco flat insoles and cut out the toes to give more room. Use one pair and you can make a 1/4th inch lift for one side (almost 6 mm). These can be purchased all over. Sure hope this helps you. 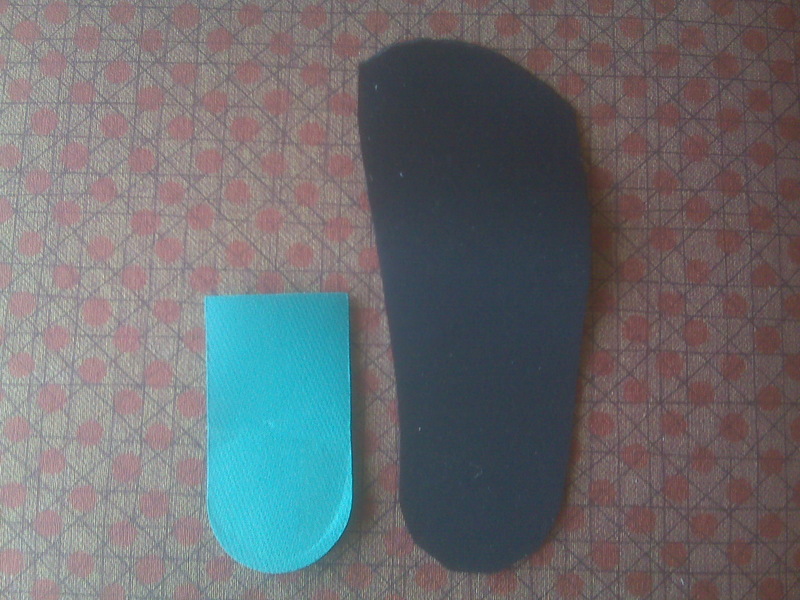 Here the black side of a Spenco insole with the toe part cut out is being compared to a typical heel lift. Here Grinding Rubber from JMS Plastics is being formed into a full length lift and a heel lift. Here a Spenco insole is being used as a lift of the short left side and an accommodation for a painful big toe joint. I hope 2012 is treating you well! You were so helpful to me last year when I was struggling with my sesamoiditis diagnosis. I am still spreading the gospel of the Even-Up. I have another question now. I have had a pain in my right inner arch over the past few days, worse upon waking. From my reading I suspect it is the beginning of plantar fasciitis. I read your post about arch height-- for the record I have very high arches and VERY tight calves (one surgeon I saw for the sesamoiditis said I'd never be able to stretch them enough and recommended I get both gastrocnemiuses cut). I stretch them on a foam wedge every morning but maybe it's not enough. With sesamoiditis on both feet (I have bipartitite sesamoids) I want to be very careful about how to do stretches for the plantar fasciitis! I've already refused to "walk the dog" from the downward facing dog in my yoga class, because I feared for my sesamoids... Do you have any specific instructions? Also, I guess it's time to face up to the fact that it might be good to wear plantar fasciitis splints at night. But again, some of them look like they pull against the sesamoids in a bad way! And I guess I should wear them on both legs, and so the big bulky ones would be hard to manage. Do you have any splint suggestions? Thank you for your ideas-- it is such a blessing to feel I can ask you and get a trustworthy answer. Hey Toni, Thanks for the email. 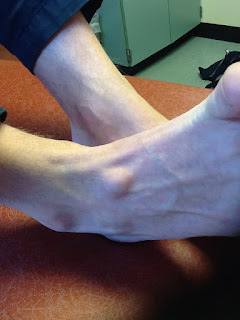 That is not a typical place for plantar fasciitis, but it may be. I have attached a video on plantar fascial stretches that do not pick on the sesamoid, another video on kinesiotaping for arch support, and ways to accommodate the sesamoid if you do go to the removable boot. Rich Also consider the rolling ice stretch twice daily described in the basic plantar fasciitis treatment posts. Thanks for you confidence in me. If you’re wondering about the health of your heart, try looking at your feet. The lowly, stepped-on, shoe-squished foot could very well hold clues about the state of your coronary arteries. If your feet show signs of poor circulation – or peripheral arterial disease – your heart could be suffering as well. Dr. Marisha Stawiski, a Grand Rapids podiatrist, says she regularly checks patients for the subtle signs that could indicate PAD. A loss of hair on the feet is one possible sign of poor circulation. That doesn’t mean that people who have always had smooth, rather hairless feet have PAD, she said. “But if you have somebody with a lot of body hair and none on their feet and ankles, it could indicate an arterial issue,” she said. Different pulses, very cold feet, or a change in color also could indicate a problem. If she sees any signs of PAD, Stawiski recommends a simple, non-invasive test called an ankle-brachial index. It compares the blood pressure in the ankles to the blood pressure in the arms. This is an email I just received from a great tennis player and dad!! What ankle braces do you recommend? I have been wearing the lace up type on my left ankle only, but I rolled my right ankle yesterday which proceeded to swell quickly. I have been using ice and compression and the swelling is down. 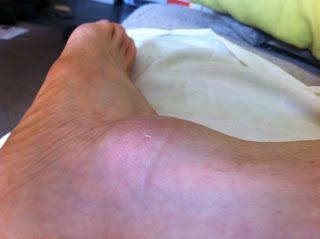 I realize now that if I want to continue playing tennis, I will need to wear one of the right ankle as well. 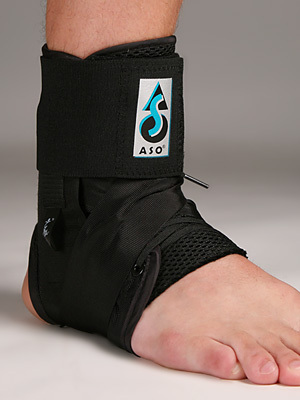 I love the ASO Ankle Brace and this is the one I use occasionally when my old injured ankles are at risk (like on the basketball courts). This nice patient presented one month ago with a 2 month history of very severe pain in her metatarsals (pain levels on 8-9 out of 10). There has to be something broken or nerve involvement to have that high pain level. 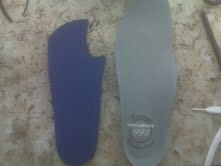 New orthotic devices were given to her 2 weeks ago since she stands all day at work. We are trying to avoid a removable cast, which will make her job difficult. There is her 2 week email followup and my response. Hi Dr. Blake. This is the 2 week report. 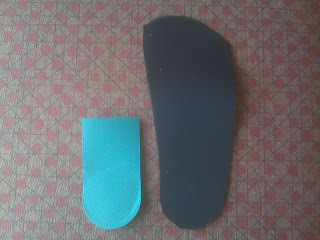 I'm wearing my new orthotics all of the time now and am attempting to be optimistic. When the inflammation occurs after a short shift at work(4 hours), I recover nicely the next day. Yesterday, I had a 7 hour shift and today I'm pretty swollen and need to stay off of my feet. By tomorrow, I'll probably be much better. It seems like I have to be very strategic about how I spend time on my feet. There's a threshold for how much I can handle. So, do you have any suggestions? Yes, I am alternating hot/cold . I'd love to hear your words of wisdom. Thanks. Bobbie (not her real name), Thanks for the email. Sounds like you are doing every thing right. Definitely do the contrast bathing once a day and add an ice pack for 10 minutes twice per day. I could have the physical department experiment with various forms of taping for you to do, and they could do some treatments of anti-inflammatory stuff to cool things down. I had 3 types of orthotic devices to choose from initially and I chose the Root Balanced Technique to maximize the metatarsal support. I definitely may have to change it to get more stability. It's been almost a year since I last was in contact with you. I sprained my ankle today, and wanted to check in with you. 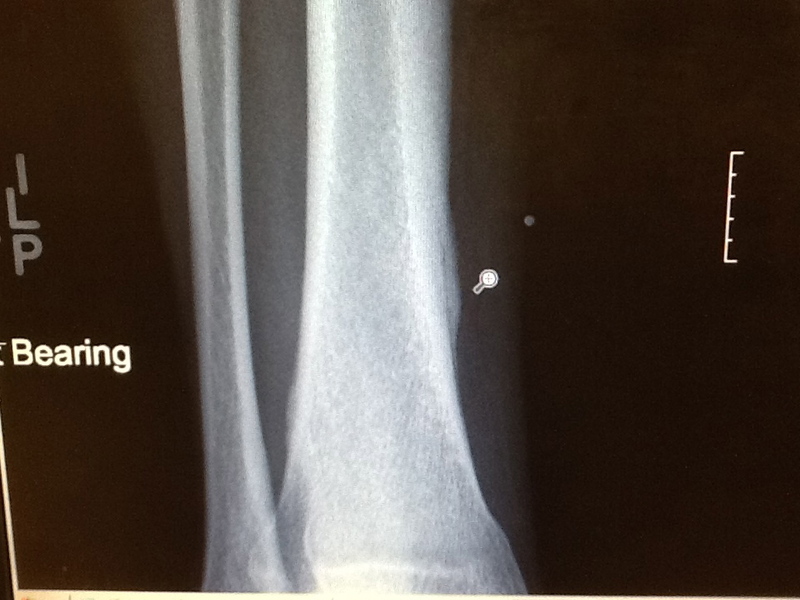 Last year it was the right ankle, today it was the left. I looked at your blog, but I wanted to clarify a few things with you directly. I am elevating and icing and took some ibuprofen. I still have a few compression socks and horseshoe padding from last time. Should I start that right away? Should I not use the padding while icing? I remember how to do the contrast baths, but I seem to recall that I'm supposed to wait a day or two before starting those. Please let me know if I should come in to see you. I'm pretty sure it's just a sprain. Ice: All the wonderful Anti-Inflammatory measures we have available including avoiding certain foods. Elevation: Even 1 inch off the floor makes a difference, but get it up as much as you can for the first 4 to 14 days.Control that swelling. One reason why there are no high quality evidence studies for gout is due to the fact that the complexities of effective management make it difficult to treat. In Dr. Purdy's community of southern Louisiana, I am certain that primary physicians see lots of gout. Their lack of aggressiveness is not from a lack of understanding the disease, but from the difficulty of getting patients to abstain from the obvious, namely beer. Beer has guanine in it which is rapidly metabolized into uric acid. Beer is the major culprit. So when a patient has a six-pack on Saturday night, you can almost predict that the patient will be in your office or in the emergency room on Monday. Patients also eat shellfish (namely mud-bugs and shrimp) as well as organ meat, and lots of red meat. Forget about high-purine vegetables - it turns out they are not a problem. Dairy products tend to decrease uric acid to some extent. This is all relatively new data that has come out in the literature. I saw you about a month ago. 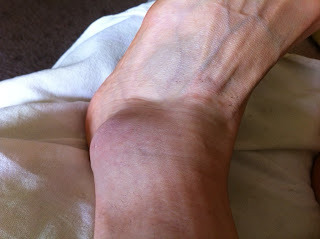 I have chronic ball of foot pain (had been present for 3 months) that although lessening is still stubbornly persisting. The budin splint you suggested I get has helped. Budin Splint with Metatarsal Pad attached to limit motion and re-distribute weight around the 2nd Metatarsal. The pain is has "moved" and is now below my second metatarsal. I've been running on it 3 days a week and this definitely aggravates it. Do you think the Neuro-eze cream might help me? Do you think that cortizone could help (oral or injection)? I would like to keep training. I will make an appointment to see you again if you think it would be beneficial. Thanks for the email followup. Neuro-Eze may help if the symptoms are neurological. Probably more inflammatory. I could give you a Rx for Voltaren Gel to massage in 3 times daily. I will leave with my asst Kathy. Call her Monday with the pharmacy number. If the Budin Splint is working, tighten it alittle each week. Thanks so much for your prompt response. It means alot to me! I will call Kathy in the morning for the Valtaren gel. I tightened the splint today and felt some more relief so I think that is a good sign. The soreness after I run is managable and does not affect my gait and definitely no limping or anything like that. It's very stubborn though! I'm trying to balance the running with cross training and I'm being as conservative as I can without losing my fitness. I will review your good pain bad pain post. 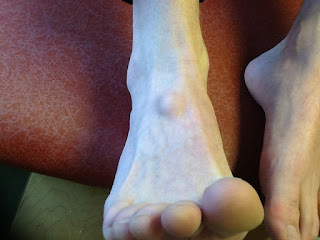 Many patients present to my office with lumps on their foot that either appeared suddenly or gradually grew. These are normally ganglion cysts, formed by fluid leaking from tendons or joints. They are totally benign, and occasionally have to be surgically removed. But most patients are told to ice massage them in a circular manner 2 times per day to see if they can break them done. Before any thought of surgery, the ganglions should be drained in an office setting, one or two times. If the ganglions are not superficial, then cortisone can be injected after the draining to further increase the chance that they will not return. If you do get them drained, you need to spend one month with a compression wrap and extra padding over the ganglion to help prevent it from refilling up again. Here is an example of a ganglion from a recent patient. Like some patients, this patient also had a ganglion on his wrist that did need surgery. Ganglion patients can get other ganglions. These benign lumps are not attached to the skin, are soft to pressure, and can only be documented on MRI or ultrasound. 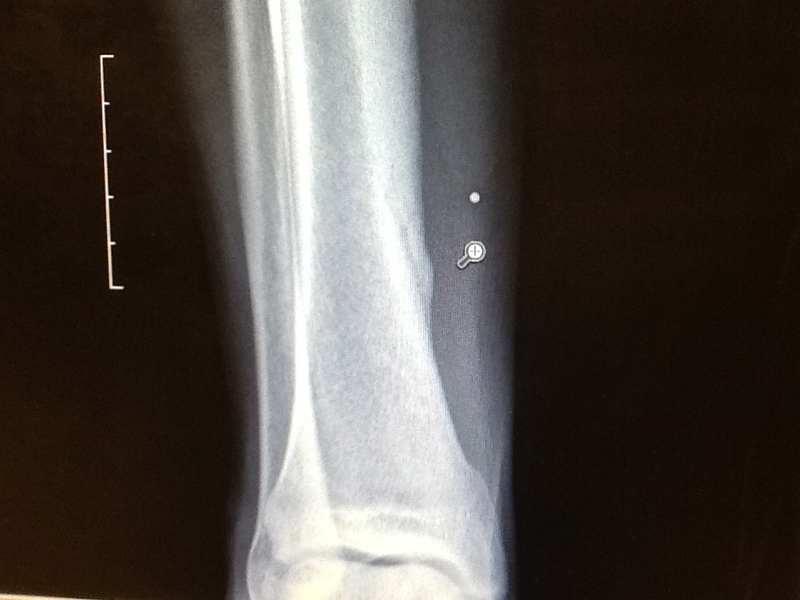 X-rays should be negative. Since ganglion cysts can develop from herniations in the ligaments of an arthritic joint, X-rays may show boney changes under the ganglion. If you can use ice massage to shrink them, routine ice massage 2 to 3 times per week may help keep them from coming back. These inserts tell a wonderful tale about this athlete. See if you can find all these clues, and find Waldo while you are at it. The foot functions more to the lateral heel (inverted) on the left. The left has a more dramatic push off. The pronation is a little more to the right, but both sides are fairly centered. Pushoff is more explosive on the left.